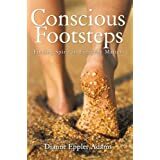 Conscious Footsteps: Finding Spirit in Everyday Matters by Dianne Eppler Adams is a unique find in the world of books of spirituality. Dianne draws upon her own heightened awareness and her experience as an astrologist to bring an entirely new refreshing perspective to books on spirituality. Conscious Footsteps: Finding Spirit in Everyday Matters is a self-help book in that it does help highlight practices you could now be doing to help you and the world around you to achieve better balance and happiness. Adams recognizes we are going through difficult times and acknowledges that more of the same is likely, but she shows ways, such as focusing on the positive or helping with a charity, to get through these times. As she aptly points out the key to surviving these times is to take the focus off of ourselves and put it on someone, or something else. Another thing Adams emphasizes is the fact it is better to say nothing at all than to tell even a “white lie.” She uses the example of someone asking us how we are and the fact we almost invariably reply with “fine.” Adams points out that it’s better to say nothing than to answer that you are fine if you aren’t. Don’t be rude or anything, just come up with a true, but non-committal answer. Adams also strongly emphasizes out uniqueness and how important our opinion is, even when it differs from that of the world around us. Voicing our opinion can help other see another side and may help bring balance, or a better resolution to a situation. She also points out that we need to honor ourselves in our lives, opinions, relationships and interactions with others and the world around us. We need to find ways to both give and receive in our relationships so we can be fulfilled and have an inner well of strength to draw on. We need to not allow fear to hold us back. That only brings about more fear and a constriction in the natural flow of things.